Elizabeth Flores was one of the many awardees honored. She maintains a 4.0 GPA with the University of Maryland University College — Europe. 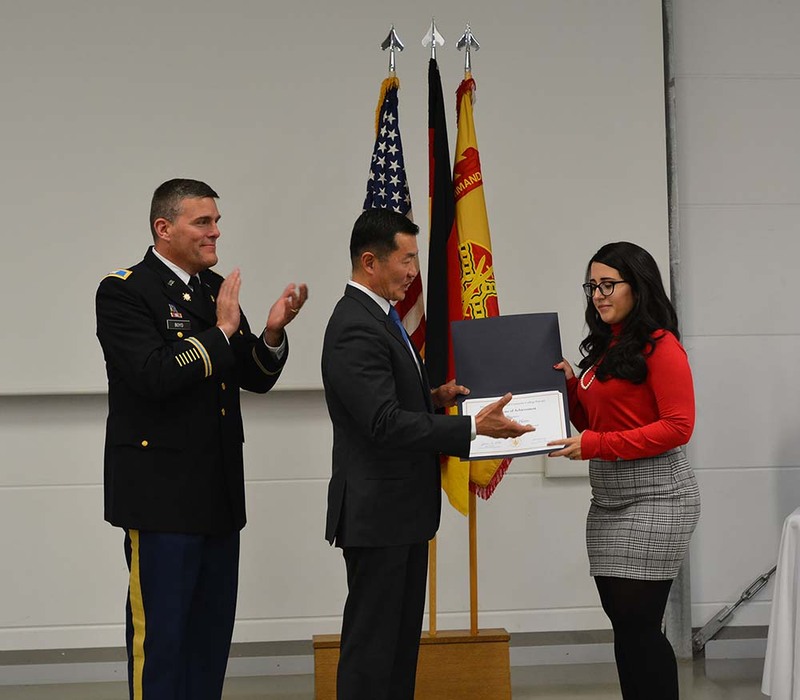 GRAFENWOEHR, Germany – The Education Center at U.S. Army Garrison Bavaria hosted its 5th Annual Military Academic Achievement Awards Nov. 14. The Directorate of Human Resources, the Army Continuing Education System office and the Tri-Services Academic Institutions recognized 19 outstanding student scholars. The University of Maryland University College – Europe, Central Texas College, Embry-Riddle Aeronautical University and the University of Oklahoma honored service members, veterans, and family members. While the honorees varied from active duty members to civilian, most active duty military students take courses online and not in the classroom. This event enables those not normally given the chance to participate in an official ceremony to be honored academically in front of their families. The ceremony showcased all students of certificate, associate, bachelor’s and master’s degree programs. “This our fifth year hosting this event and it gets better each year,” said Kathleen Connolly, Education Services Officer, USAG Bavaria. Working in partnership with the Education Services Division, USAG Bavaria is leading the way with a holistic approach toward education. “Since last year, over 2,100 Soldiers in the USAG Bavaria footprint have completed over 6,000 college courses using over $4 million in Army Tuition Assistance,” said USAG Bavaria Garrison Commander, Col. Adam Boyd. The USAG Bavaria community has many working professional students. One of these many awardees was Elizabeth Flores, who maintains a 4.0 GPA with the University of Maryland University College — Europe. “One of the most important aspects of this whole experience is the opportunities now given to me through education,” said Flores. Many of the senior educators stressed the importance of education. “If you choose not to pursue an education, you can only blame yourself,” said Tony K. Cho, Vice President, Director of European operations, University of Maryland University College – Europe. This annual event coincides with the American Education Week Nov. 12-16. Celebrating during the AEW provides a way for communities to honor individuals who seek to make a difference. “This week USAG Bavaria Education Services and educators from across the country have joined forces to reinforce our commitment to provide quality education for our Service Members worldwide,” Connolly said. U.S. Army Garrison Bavaria Army Education Centers host a variety of activities and events to promote the importance of lifelong learning opportunities within the military. Contact the Education Centers for more information. At Rose Barracks dial DSN 476-2753, CIV 09662-83-2753; Hohenfels DSN 466-2259, CIV 09472-83-2259.